B O O T L E A D: Médici: A great soldier and a great honor. Médici: A great soldier and a great honor. b. 4 Dec 1905, Bajé, RS. d. 9 Oct 1985, Rio de Janeiro, RJ. 30 Oct 1969 - 15 Mar 1974. 25 Oct 1969, elected by the electoral college. 30 Oct 1969, took the oath of office at the session of the National Congress, Congressional Palace, meeting hall of the Chamber of Deputies, Brasília, DF. 15 Mar 1974, presidential functions expired. A descendant of family with Italian-Basque origins, Emílio Garrastazu Médici was educated at military schools of Porto Alegre and Rio de Janeiro. He was commissioned a second lieutenant in 1927 and first lieutenant in 1929. The Revolution of 1930 found Médici at Bajé, Rio Grande do Sul, where he liaised between the military and civil plotters. Médici participated in the suppression of the Constitutionalist Revolution in São Paulo (1932) and earned the promotion to captain in 1934. Médici enjoyed a steadily growth in his military career and was nominated (1957) chief of the staff of General Artur da Costa e Silva, who became Médici's close friend. Promoted to brigadier general in 1961, Médici held a number of posts until he was named military attaché in Washington, D.C. (1964). 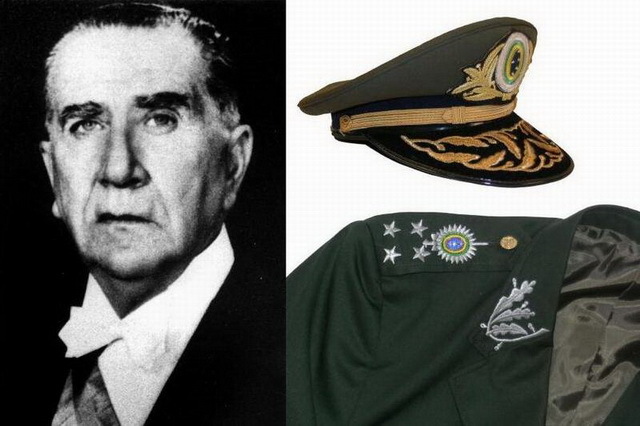 The election of Costa e Silva as president of the Republic (1967) paved the way for further promotion of Médici, who was made chief of the National Information Service (Serviço Nacional de Informações, SNI) (1967-1969), a Brazil's internal security agency. In April 1969 Médici assumed the command of the 3rd Army, but a new political crisis emerged when the military ministers took over the functions of president because of incapacitation of Costa e Silva (31 Aug 1969). As conditions of the president's health were worsening, the army high command selected three candidates for the presidency including generals Médici, Antônio Carlos Murici and Ernesto Beckmann Geisel. The military leaders favored the candidacy of Médici, who was elected unopposed by the National Congress on 25 Oct 1969 and took the oath office five days later. The same day a new Constitution of the Federative Republic of Brazil went into effect (30 Oct 1969) providing the chief executive with considerable power. Médici maintained a strong centralized government throughout his tenure as president. Despite the criticism of the opposition, the Institutional Acts remained an instrument of effective administration alongside the Constitution, while the president continued to govern by issuing ordinances. Médici officially joined the government-sponsored National Renewal Alliance Party (Aliança Renovadora Nacional [Arena]) and controlled the selection of candidates at local elections with the help of SNI. In 1970 the president enacted laws imposing further censorship on press and confirming ineligibility of certain political figures for holding state offices. Repressive acts aimed against the terrorist activities of urban guerrillas and leftist extremists, who practiced abduction of foreign diplomats, helped legitimize harsh measures in the view of public opinion. A large group of people fell victims of tortures applied by law-enforcement bodies and condemned by international community. The Médici administration made a considerable progress in economic growth, which became known as the Brazilian economic "miracle" including fast growth of economy and neutralization of inflation. Impressive dynamism of the Brazilian economic system was sustained until the end of Médici's presidency. He retired from politics when he completed his term as president and declined a proposal for his election to the Senate. Bem, seu texto está razoavelmente neutro, apesar de haver alguns pontos duvidosos, afinal, o milagre econômico foi seguido de um declínio gigantesco e uma inflação galopante após a crise de 73.